Many years ago, I remember seeing a picture of newly naturalized citizens in our local upstate New York newspaper. They were smiling, maybe even holding flags, and I sensed that they had just done something meaningful and significant. I've always thought of my naturalized ancestors approaching the process in the same sort of way. It wasn't until I did a search for "naturalization" in the Chicago Tribune Historical Archives that I realized there might be more to the story than a person's driving desire to become a citizen. In October 1858, for example, the Chicago Tribune was encouraging two groups of individuals to naturalize--men of age who had arrived under the age of eighteen five or more years previous (they could naturalize immediately without filing first papers) and men who had filed declarations two or more years previous so that the waiting period to file the final papers had passed. 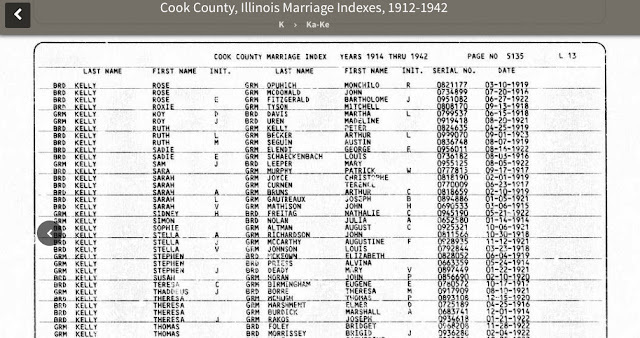 So what have I learned from the newspaper about the naturalization process in Cook County and what does it have to do with family history research? 1. Political parties encouraged aliens to naturalize as a way of increasing their voter pool. An October 1880 newspaper tells the story of an 81-year old Irish man who completed the naturalization process forty-nine years after he took out his first papers. The newspaper suggested that political party members "drew the octogenarian from his home and coax him to become a citizen so that he may help to diminish by one the minority for Hancock." If your ancestor naturalized long after he was eligible, he might have received a little bit of outside encouragement. 2. If your ancestor naturalized in October, he might have been caught up in "The Naturalization Mill." In October of 1873 the Criminal Court was "working out citizens faster than a sausage-machine turns out sausages." In October of 1880 the newspaper wrote, "the work of converting the subjects of foreign Kings, Emperors, or other potentates into citizens of the Great Republic is being very briskly carried on in all the courts of the city." There were four courts that handled naturalization in Cook County early on--Circuit, County, Criminal, and Superior--and they sometimes held evening hours in order to accommodate the large numbers of people hoping to naturalize. If you look at the indexes (available on Family History Library film) you can see the entries swell during fall voter registration pushes. The Chicago Tribune published numerous articles on naturalization in the early years and if the subject interests you, I'd encourage you to browse the newspaper on the topic. If you come up with a find worth sharing, please post a comment. ""Get Naturalized this Week." Chicago Press and Tribune (1858-1860): 0_1. ProQuest Historical Newspapers: Chicago Tribune (1849-1987). Oct 27 1858. Web. 27 Oct. 2011 <http://search.proquest.com/docview/168720474?accountid=6327>. "Local Politics." Chicago Daily Tribune (1872-1922): 4. ProQuest Historical Newspapers: Chicago Tribune (1849-1987). Oct 30 1873. Web. 27 Oct. 2011 <http://search.proquest.com/docview/171440065?accountid=6327>. "Naturalization Papers." Chicago Daily Tribune (1872-1922): 6. ProQuest Historical Newspapers: Chicago Tribune (1849-1987). Oct 27 1880. Web. 27 Oct. 2011 <http://search.proquest.com/docview/172289066?accountid=6327>. "Naturalization." Chicago Daily Tribune (1872-1922): 6. ProQuest Historical Newspapers: Chicago Tribune (1849-1987). Oct 28 1880. Web. 27 Oct. 2011 <http://search.proquest.com/docview/172275293?accountid=6327>. "Fraudulent Naturalization Papers." Chicago Daily Tribune (1872-1922): 3. ProQuest Historical Newspapers: Chicago Tribune (1849-1987). 1873. Web. 27 Oct. 2011 <http://search.proquest.com/docview/171460741?accountid=6327>.